Step 2 Place bacon slices on sheet pan and bake until half-way cooked -- about 15 minutes. Step 3 Wrap scallops with a strip of bacon and use a toothpick to secure it all together. Step 4 Either drizzle or brush maple syrup on to bacon wrapped scallops. 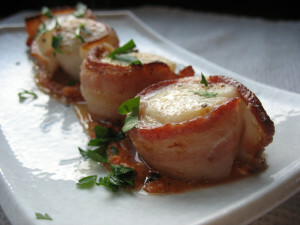 Step 5 Place the bacon wrapped scallops on a aluminum foil lined sheet pan and set under broiler. Step 6 Cook them until the bacon is crispy and the scallops opaque. Approximately 2-3 minutes per side. Step 7 When done, remove bacon wrapped scallops from broiler, place on serving dish and garnish with chopped parsley.